GOING DIGITAL: IS GHANA’S STREET ART OBSOLETE? Art can be found in almost every corner in Accra from neighborhood churches, schools and pubs to street stalls, barber shops and corporate campaigns. Art is serious business. In fact, traditional street art plays an influential part in the advertising history of Ghana. This street art features large boards painted with images of popular individuals such as Asamoah Gyan, President John Dramani Mahama, Barack Obama, Michael Essien and many others or everyday scenes of life in Ghana – Like Male House helps dating their bosses’ wives, and men trying to chat women – exaggerated to a humorous effect. Advertising in Ghana can be traced back to the 1920s, long before the country gained independence. Traditional healers and herbalists used the art of illusion as a form of advertisement to enhance the selling of their products. Employing the magic of performance, these practitioners used the techniques of song and dance, and sometimes, wild snakes to arouse the viewers’ curiosity. These enticements are still practiced in Ghana today. During the 1970s, Ghanaians started adopting some western styles of advertisement like printing on paper and Public Address systems. As Ghana shifted between multiple military regimes throughout the seventies, the equipment needed to produce industrial ads was hard to come by. The cost effective and highly customizable practice of using painters to create commercial ads continues to be the most popular mode for promoting goods and services. Shop owners still contract traditional artists to paint their shops, kiosks, cars and signage. In the late eighties, Ghanaian businesses began shooting TV and radio commercials and the country’s advertising journey has been evolving simultaneously with technology. However, the expansive presence of digital media is also posing a threat to the business of traditional street art. Most forms of advertisement in Ghana is now going digital. This can clearly be seen in the city of Accra, as more local businesses are mounting digital billboards and signs to sell their branded products and services. The ad jobs are increasingly going the digital route leaving lots of street artists without viable employment. A Digital Billboard Ad. in Accra! Antwi Boasiako is a 48-year-old local street artist in Dzorwulu. His gallery is under a tree by Abelenkpe traffic light. Boasiako has been painting for 20 years and he believes digital media is taking away his customers. The number of paintings he would complete annually has reduced by half. “Now the advertising works and signage are being done with computers and big printing machines. People don’t bring their works here any more. They want them fast so they send them to the big companies,” says Percy Yanyi-Ampah, a street artist at Boyz 2 Men Art, an art studio opposite the Accra Girls Senior High School. Percy shares a smile with his painting!! Even with competition from digital media advertisers, mobile entrepreneurs and small-scale businesses are still patronizing the works of these traditional street artists. 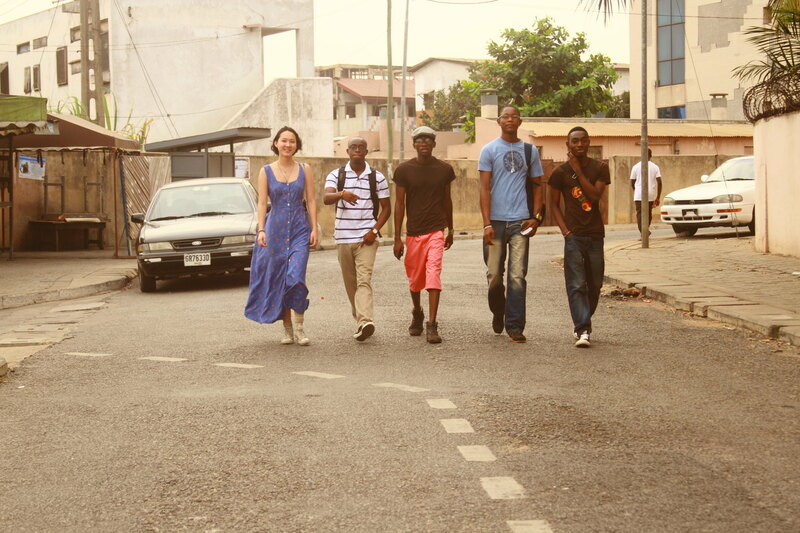 International tourists to Ghana are also enthusiastic about arts on the streets. Some of these visitors have established business links with street artists, and so they export some works, mostly to Europe and North America. He says some local chop spots, bars, hotels, and even construction companies call him to paint on their buildings and vehicles. Percy is still hoping to reestablish contact with his long lost customers. He explains that while customers still request his painting services, he’s often asked to copy an existing image rather than create a unique visual statement. This very compromise has driven some street artists to take up the study of digital printing and graphic design as a way to find and maintain work. It is easy for popular people around the world to find their photos on the streets! A traditional sign writer in Accra New Town, Gift Asamoah thinks the reason why people are going digital is because the production process is faster compared to painting. He says he has started a designing course at a computer school in his neighborhood. With a little computer education, he’ll be able to do more works in a shorter timeframe, since it’s faster to design with a computer. Eunice Annan is a female traditional artist who has stopped painting for some time. She now owns a printing and designing studio at Pig Farm. Eunice says she started painting some 14 years ago after completing Senior High School (SHS). She shares that the street art business has, literally, fallen by the roadside. If she hadn’t joined the digital trend, she might have ended up unemployed. But Percy and Boasiako do not agree with Eunice entirely. They believe demand for traditional art has gone down but it has not collapsed. If some components of digital media are adopted and combined with traditional art, they can compete equally with the digital media artists. With the changing trends and the fast evolution of technology, traditional street artists in Ghana can only stay in business if they digitize some aspects of their work. Putting a Family on Canvas. Some of the street artists are now painting in 3D as a way to keep up with the quick design pace of digital media. With the digitization of certain aspects of traditional forms of Ghanaian art, street art will continue to exist and interact, in new ways, with digital media. Reblogged this on Speak Ghana.